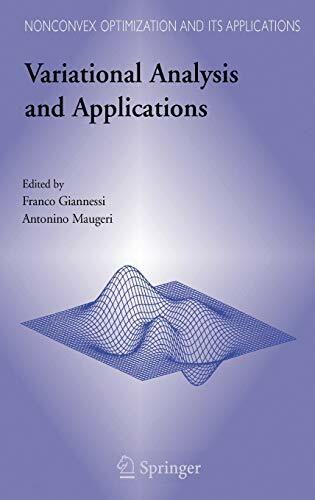 Riassunto: This Volume contains the (refereed) papers presented at the 38th Conference of the School of Mathematics "G.Stampacchia" of the "E.Majorana" Centre for Scientific Culture of Erice (Sicily), held in Memory ofG. Stampacchia and J.-L. Lions in the period June 20 - July 2003. The presence of participants from Countries has greatly contributed to the success of the meeting. The School of Mathematics was dedicated to Stampacchia, not only for his great mathematical achievements, but also because He founded it. The core of the Conference has been the various features of the Variational Analysis and their motivations and applications to concrete problems. Variational Analysis encompasses a large area of modem Mathematics, such as the classical Calculus of Variations, the theories of perturbation, approximation, subgradient, subderivates, set convergence and Variational Inequalities, and all these topics have been deeply and intensely dealt during the Conference. In particular, Variational Inequalities, which have been initiated by Stampacchia, inspired by Signorini Problem and the related work of G. Fichera, have offered a very great possibility of applications to several fundamental problems of Mathematical Physics, Engineering, Statistics and Economics. The pioneer work of Stampacchia and Lions can be considered as the basic kernel around which Variational Analysis is going to be outlined and constructed. The Conference has dealt with both finite and infinite dimensional analysis, showing that to carry on these two aspects disjointly is unsuitable for both. Contenuti&colon; PART 1 The Work of G. Stampacchia in Variational Inequalities (J.-L. Lions) In Memory of Guido Stampacchia (M.G. Garroni) The Collaboration between Guido Stampacchia and Jacques-Louis Lions On Variational Inequalities (E. Magenes) In Memory of Guido Stampacchia (O.G. Mancino) Guido Stampacchia (S. Mazzone) Memories of Guido Stampacchia (L. Nirenberg) In Memory of Guido Stampacchia (C. Sbordone) Guido Stampacchia, My Father (G. Stampacchia) PART 2 Convergence and Stability of a Regularization Method for Maximal Monotone Inclusions and its Applications to Convex Optimization (Ya. I. Alber, D. Butnariu and G. Kassay) Partitionable Mixed Variational Inequalities (E. Allevi, A. Gnudi, I.V. Konnov and E.O. Mazurkevich) Irreducibility of the Transition Semigroup Associated with the Two Phase Stefan Problem (V. Barbu and G. Da Prato) On Some Boundary Value Problems for Flows with Shear Dependent Viscosity (H. Beirão da Veiga) Homogenization of Systems of Partial Differential Equations (A. Bensoussan) About the Duality Gap in Vector Optimization (G. Bigi and M. Pappalardo) Separation of Convex Cones and Extremal Problems (V. Boltyanski) Infinitely Many Solutions for the Dirichlet Problem via a VariationalPrinciple of Ricceri (F.Cammaroto, A.Chinnì, and B. Di Bella) A Density Result on the Space (A.O. Caruso and M.S. Fanciullo) Linear Complementarity since 1978 (R.W. Cottle) Variational Inequalities in Vector Optimization (G.P. Crespi, I. Ginchev and M. Rocca) Variational Inequalities for General Evolutionary Financial Equilibrium (P. Daniele) Variational Control Problems with Constraints via Exact Penalization (V.F. Demyanov, F. Giannessi and G.Sh. Tamasyan) Continuous Sets and Non-Attaining Functionals in Reflexive Banach Spaces (E. Ernst and M. Théra) Existenceand Multiplicity Results for a Nonlinear Hammerstein Integral Equation (F. Faraci) Differentiability of Weak Solutions of Nonlinear Second Order Parabolic Systems with Quadratic Growth and Non Linearity (L. Fattorusso) An Optimization Problem with Equilibrium Constraint in Urban Transport (P. Ferrari) Sharp Estimates for Green’s Functions: Singular Cases (M.G. Garroni) First-Order Conditions for Constrained Vector Optimization (I. Ginchev, A. Guerraggio and M. Rocca) Global Regularity for Solutions to Dirichlet Problem for Elliptic Systems with Nonlinearity and with Natural Growth (S. Giuffrè and G. Idone) Optimality Conditions for Generalized Complementarity Problems (S. Giuffrè, G. Idone and A. Maugeri) Variational Inequalities for Time Dependent Financial Equilibrium with Price Constraints (S. Giuffrè and S. Pia) Remarks about Diffusion Mediated Transport: Thinking about Motion in Small Systems (S. Hastings and D. Kinderlehrer) Augmented Lagrangian and Nonlinear Semidefinite Programs (X.X. Huang, X.Q. Yang and K.L. Teo) Optimality Alternative: a Non-Variational Approach to Necessary Conditions (A.D. Ioffe) A Variational Inequality Scheme for Determining an Economic Equilibrium of Classical or Estended Type (A. Jofre, R.T. Rockafellar and R.J.-B. Wets) On Time Dependent Vector Equilibrium Problems (A. Khan and F. Raciti) On Some Nonstandard Dynamic Programming Problems of Control Theory (A.B. Kurzhanski and P. Varaiya) Properties of Gap Function for Vector Variational Inequality (S.J. Li and G.Y. Chen) Zero Gravity Capillary Surfaces and Integral Estimates (G.M. Lieberman) Asymptotically Critical Points and Multiple Solutions in the Elastic Bounce Problem (A. Marino and C. Saccon) A Branch-and-Cut to the Point-to-Point Connection Problem on Multicast Networks (C.N. Meneses, C.A.S. Oliveira and P.M.
2. Variational Analysis and Applications.